One of the puzzles facing the film historian (amateur or professional) occurs when a child climbs upon the parental knee and asks, “Well, Dad, what was the black list?” The parent struggles to explain that, once upon a nervous time, the Hollywood movie was said to be rife with un-American suggestions and the energetic insinuation of socialist alternatives. The father blinks: Is it just his customary paranoia, or could it be that his own child’s articulation hints at some body-snatching invasion? So the father struggles to recall one film—any film—that might have been thrown like acid at the solemn, fearful mindlessness of American society. It’s not easy, but then he is rescued: Here comes a re-release on Blu-Ray of Abraham Polonsky’s unbelievable Force of Evil (1948). Why “unbelievable”? Because it is hard to see how that film got made. Even its enthusiasts struggle to say it was just a film noir or a John Garfield picture, another romance about organized crime. But when the child is shown the film (the child in question is 23, out of the University of Chicago), he gets it. The organized crime in Force of Evil isn’t one more adolescent noir dream loaded with tough male wishful thinking and an abiding fear of women. It’s a black fable out of Karl Marx, but shot as if Fritz Lang had made it in Germany. And then there’s the talk. All right. I am sensible. I am calm. I’ll give you my answer, calmly and sensibly. My final answer. My final answer is No. My final answer is finally No. No! No! No! N – O! The speech is delivered like vomit by Gomez, yet as you hear it you feel not just the naturalism of outrage but cadence and rhythm, and the repetition of poetic language. That’s why I’ve typed it up like verse. Time and again, Force of Evil takes on this surge of rhetoric. It is theatrical and epic, rather than hard-boiled and realistic. Polonsky wrote and directed the film after he had written Robert Rossen’s boxing story, Body and Soul, with Garfield as a fighter who yielded to corruption. That’s a strong film, but Polonsky felt it never escaped the boxing genre or reached the level of fable. So Garfield urged him to direct Force of Evil himself. Polonsky did the script from Ira Wolfert’s novel, Tucker’s People, and Wolfert has a co-credit on the screenplay. 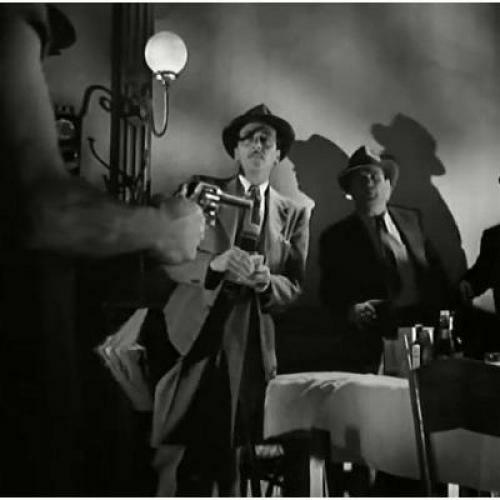 What makes the film so uncommon and so much more than a noir melodrama is the way that controlled tension between criminal lowlifes and poetic talk is matched by the stylization of décor and action soaring above the elements of a crime film. The art direction was by the very talented Richard Day (his credits included The Grapes of Wrath, How Green Was My Valley, Fritz Lang’s Man Hunt, and then later, On the Waterfront). The ambition in the film’s look begins with a view of Trinity Church jammed between Wall Street towers and ends with metaphor as Joe descends endless steps beneath the George Washington Bridge to find a corpse in the river. Along the way, the film sees every staircase as a moral structure. There is a brilliant scene with a high mantelpiece on which Joe deposits an argumentative young woman (played by Beatrice Pearson). Pearson is an intriguing actress: very pretty in a Sylvia Sidneyish way, and plainly smart and skilled. She seems to have been Garfield’s discovery, and she made just one more movie. This willful and self-conscious artistry has disturbed some viewers—they complain that it’s not playing fair by the rules of film noir. But Polonsky’s target was the structure of capitalism and the way the numbers racket was a mockery of the banking system. That seems less fanciful in 2012 than it might have done in 1948 (though that was the year in which anti-trust legislation finally came to grips with the film industry). Not too long after Force of Evil opened, Polonsky was blacklisted: He had been a Communist party member as well as an OSS agent who went behind enemy lines. Ira Wolfert was black-listed too, and John Garfield was so pressured to testify that his weak heart undermined him. He died in 1952, aged 39. Polonsky had made the real thing: an American movie that dissected capitalism. He was a very smart man, acerbically funny and he survived wilderness years to come back—he directed the Western, Tell Them Willie Boy is Here, in 1969. There’s a good book about him, by Paul Buhle and Dave Wagner, titled A Very Dangerous Citizen. That’s a fair description, but not an excuse for black lists. America was once a country for dangerous men and brave ideas, and Force of Evil (along with Joseph Losey’s The Prowler) may be the best and most disconcerting films made by people who were headed for exile or the underground. Take a look at it, and have a double bill, playing it with Elia Kazan’s On the Waterfront. Polonsky despised Kazan, who had agreed to name names for the sake of his career. On the Waterfront was Kazan’s attempt at vindication. It’s a contorted story about the need to inform on people, and it’s famous now for Marlon Brando and Rod Steiger as brothers in the back of a cab talking about contending and betrayal. The resonance in Force of Evil is all the greater when you keep Waterfront in mind (and Polonsky did a great scene in a cab). The Kazan picture won many Oscars and it made the director a more interesting artist. (Kazan needed self-loathing to inspire him.) But Force of Evil is the better film, and it may be enough to take away the talkative breath of your aging child. With its gallery of vivid supporting players, it is as if Dickens had done a movie.